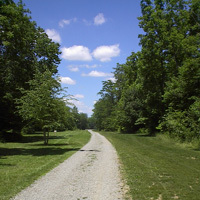 Mill Valley Park is a really grassy environment with lots of mature trees and an active stream that runs the length of the park. 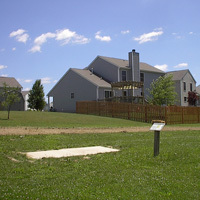 Front 9 is fairly short wooded and technical. Back 9 is longer and more open. There are some interesting elevation changes on a number of holes which is a rarity in central Ohio. The course is a bit chopped-up with several longer than usual and one really long walk between holes. If you haven't played here before expect to spend some time figuring out the layout (a few more directional signs would make it easier). 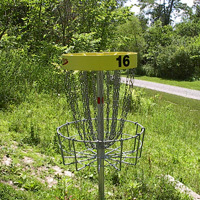 Long and short tees are pictured on most tee signs but we could only find short pads. 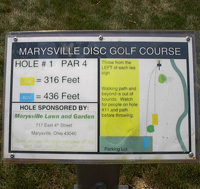 The course is located in Mill Valley Park in Marysville, Ohio. 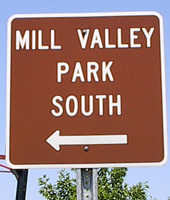 From Rte 270 in the NW Columbus Area take Rte 33 north approximately 17 mi; exit Rte 31 North (toward Kenton); turn right and then left at the first traffic light (McDonalds); go approx 1 mi ; turn left on Valley Dr; at the dead-end turn right; take a quick left into Mill Valley Park South; first tee is at the south end of the parking lot.